There are two types of reasoning that people can use to draw conclusions: intuitive and analytical. Everyday reasoning requires students to know when intuitive and analytical reasoning are appropriate and how to use each. Collaborative work can facilitate students’ use of everyday reasoning. Humans gain a great deal of valuable information about their environment through the use of intuitive reasoning. This kind of reasoning is rapid or automatic, as it generally relies on instinct or inferences. Analytical reasoning, in contrast, occurs when people use evidence to arrive at logical conclusions and is particularly helpful in unfamiliar situations. While both types of reasoning are necessary, using intuitive reasoning when analytical reasoning would be more appropriate can lead to poor decisions or questionable assumptions, such as stereotypes. Therefore, it is essential that students learn to use intuitive and analytical reasoning in tandem—a process we call everyday reasoning (pp. 2–3). Many professions, such as computer programmers and scientists, use everyday reasoning to come to conclusions that require both inference and evidence. When students employ everyday reasoning, they not only become better at interpreting their perceptions and making decisions, but also at evaluating the positions of others. Everyday reasoning can help students delineate which assumptions or evidence led to another’s conclusion and prepares them to be more speculative when they consider others’ statements. However, research suggests that analytical reasoning is not an instinctual skill. Fortunately, with direct instruction and practice, analytical reasoning can become as instinctual as intuitive reasoning. 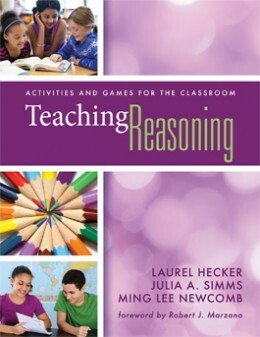 Activities that challenge students to reason analytically, by extension, also develop their use of everyday reasoning, as this process requires an understanding of both types of reasoning (p. 4). Research indicates that discussion and dialogue are closely linked to the development of reasoning skills. In a group setting, students can present arguments and consider the counterarguments of their peers, which in turn helps them learn to support their reasoning and evaluate the viewpoints of others. Teachers can promote friendly controversy, which enhances engagement and learning, by encouraging students to express a variety of opinions and through the use of activities like reasoning games. Additionally, studies have shown that students who work collaboratively have a deeper understanding of content, are better problem-solvers, and approach tasks more critically than students who do not. In sum, working in groups can allow students to practice the essential analytical skills that contribute to everyday reasoning (pp. 5, 37–38). The skills associated with the complex cognitive tasks of argumentation and reasoning require that students practice them often in order to fully master them. To this end, we recommend the use of activities and games in the classroom, as they facilitate the practice of these necessary skills while simultaneously heightening student engagement and achievement. Activities and games rely on two teaching strategies to maintain student engagement—academic games and friendly controversy. Use of academic games in the classroom has been linked with an average gain of 20 percentile points in student achievement (Haystead & Marzano, 2009), whereas friendly controversy has been tied to increased rates of curiosity, achievement, and positive attitudes among students (Lowry & Johnson, 1981) (p. 37). To be practical in the classroom, academic games must use inconsequential competition, or competition that does not have a bearing on a student’s grade in class. This competition can manifest as an individual game, where students compete against one another, or a group game, where a class is divided into groups, each of which competes against the others. However, regardless of form, to be an inconsequential competition, students should not be motivated by an extreme need to win or external pressures. Rather, academic games using inconsequential competition should create a friendly, low-stakes environment, regardless of whether students compete for a prize or merely the satisfaction of winning (p. 38). Researchers over the last 20 years found that mild pressure created through friendly controversy can help students focus. However, there is a fine line between mild and excessive pressure. If friendly controversy creates too much pressure in a classroom environment, students can easily become disheartened, embarrassed, frustrated, or even angry if they lose. To avoid this, teachers should not disproportionately encourage winning (verbally, with prizes, or otherwise); rather, teachers should emphasize the enjoyable and engaging aspects of playing the game itself (pp. 37–38).